I have a small amount of this material. 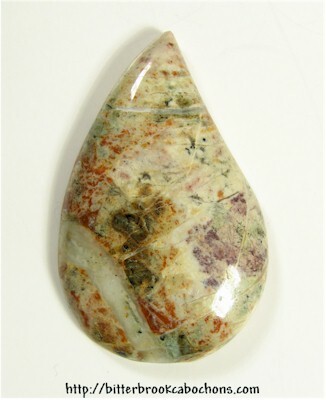 Yalakomite is a local name for a decorative stone composed of magnesite and quartz, with an attractive coloration imparted by pink jasper and green chromian phengite (mariposite) from the area northwest of Lillooet, British Columbia. And by the way, it makes really pretty cabochons! 40mm x 26mmx x 6.5mm. Weight: 50.80 carats.